Are you over winter yet? 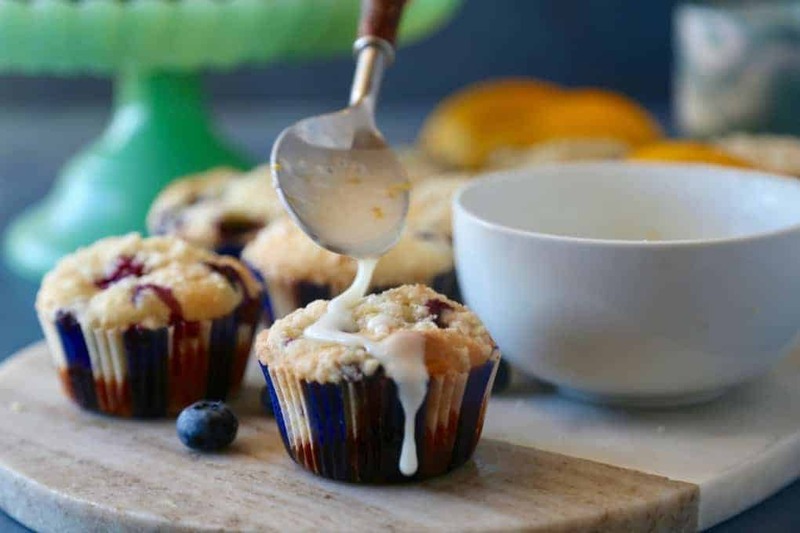 Take a bite of these delicious Lemon Blueberry Streusel Muffins for a burst of flavor and sunshine (and a delicious lemon glaze)! Topped with a simple lemon streusel, they have a bit of a crunch, and the drizzle is literally the icing on the cake. 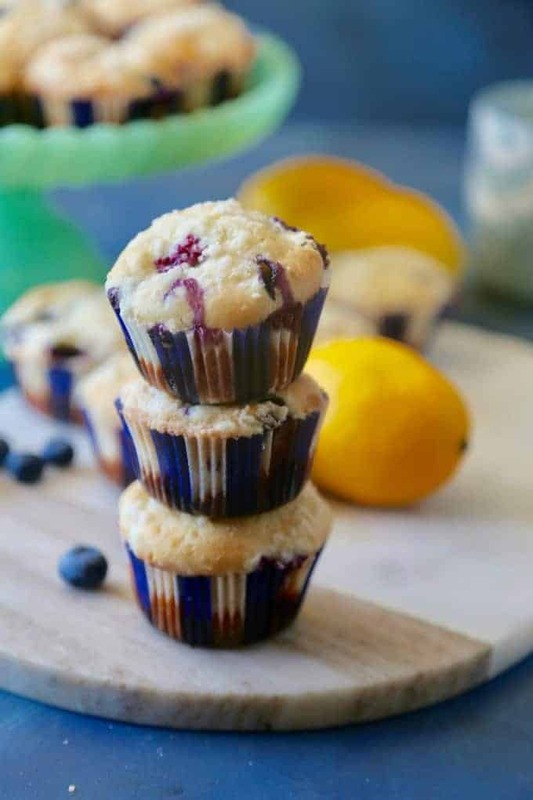 These delicious bakery style Lemon Blueberry Muffins are soft and moist and have a delicious hint of lemon. The buttery streusel and sweet lemon glaze will melt in your mouth. 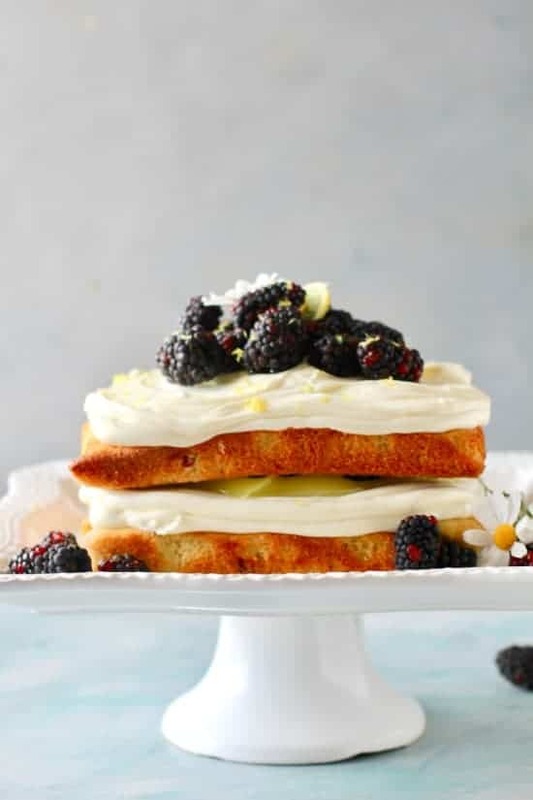 Hi friends, it’s Jackie from TheSeasideBaker.com back with another delicious recipe! Here’s a bit of a backstory about me. I grew up in between Hawaii and San Diego. I was an exchange student in Switzerland and met the love of my life…and married him! After a few years of living in Switzerland, we moved back to San Diego. Because all of my husband’s family is in Europe, most of our vacations are back to Switzerland to see family. This past winter we spent a month in the beautiful snow villages in between the Swiss and French Alps. It was absolutely beautiful, but after about 2 weeks, I missed my sunshine! I could not wait to get home and catch some vitamin D.
So these Lemon Blueberry Streusel Muffins are for all you folks that need a bit of sunshine. 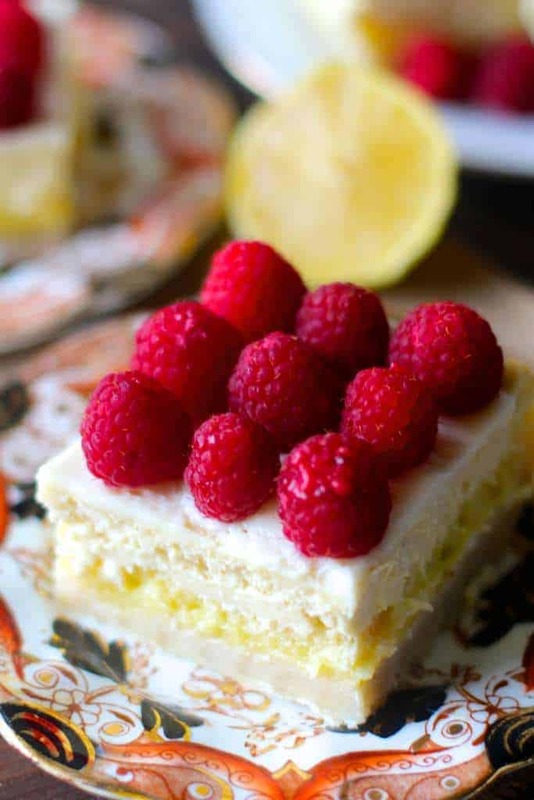 After one bite, you can almost taste Spring on the horizon with the scent of the lemon zest. The fresh blueberries pop while baking creating a mouthwateringly delicious lemon blueberry muffin. Topped with a simple lemon streusel, they have a bit of a crunch, and the drizzle is literally the icing on the cake. Looking for another easy Blueberry Muffin Recipe, this one is so easy and made with fresh blueberries or canned! 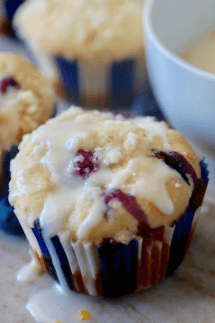 If you are in need of a simple recipe that is quick to make and perfect for breakfast, snack, or dessert, these Lemon Blueberry Streusel Muffins are it. Another favorite to check out is our Chocolate Frosted Baked Donuts. 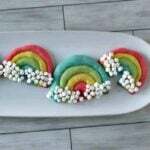 These make a a great snack or even a quick breakfast treat! 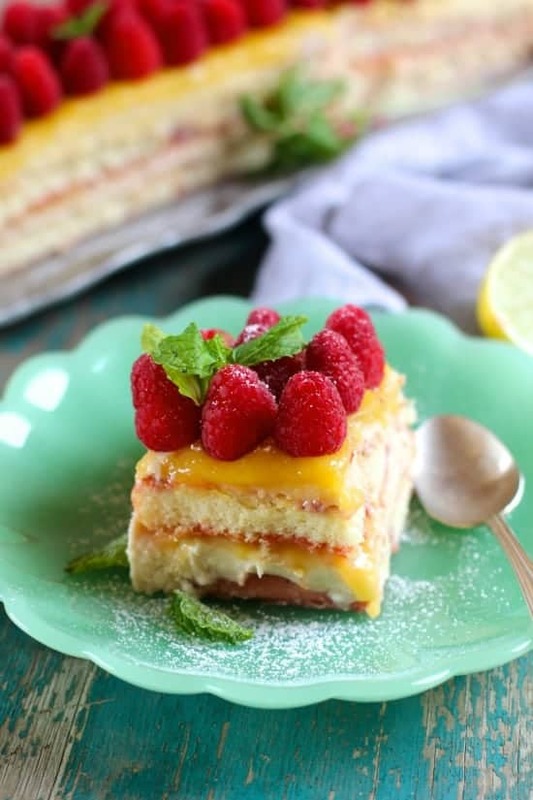 Lemon is one of my favorite ingredients, so scroll down to check out my other favorite recipes. Enjoy! If you have a microplane, that is ideal, if not a box grater will also work. Worse case scenario, use a vegetable peeler. 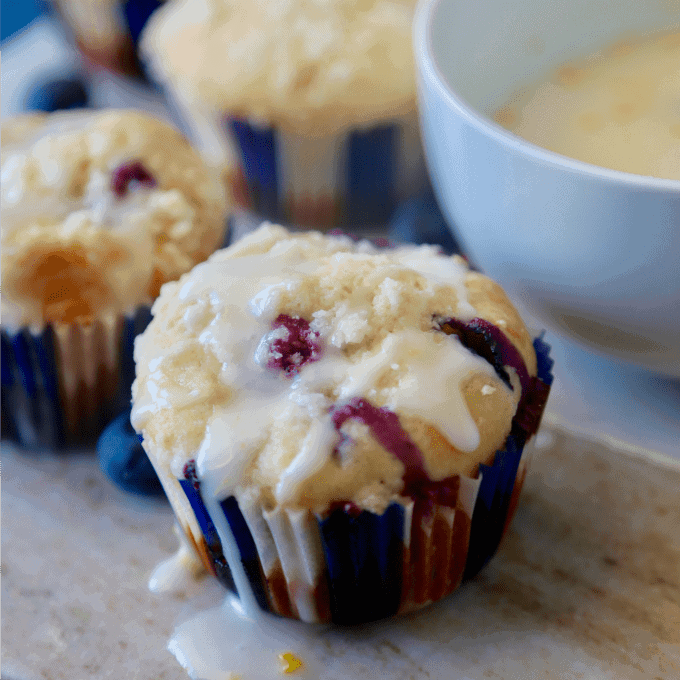 Sweet citrusy muffins studded with fresh blueberries and topped with a buttery streusel. Preheat oven to 350 degrees. 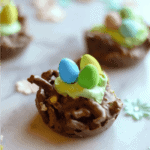 Line 2 muffin tins with cupcake liners or spray with nonstick cooking spray. Create a well in the middle of the dry ingredients, pour in wet ingredients (except blueberries). Combine flour, sugar, and lemon zest. Cut butter in, using a pastry cutter, until small pea sized balls form. Sprinkle topping over muffin tops. Bake muffins at 350° for 20-25 minutes or until a toothpick inserted in the center comes out clean. Whisk together powdered sugar and lemon juice until smooth.